Helping to improve the lives of those with severe mobility problems is one of the focuses for Rotaract Blue. 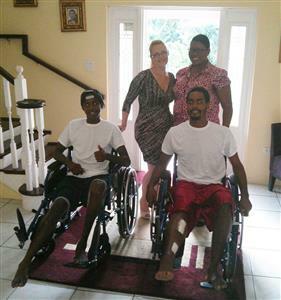 The club teamed up with Cayman Medical Supplies to donate wheelchairs to two young boys who were sadly hit by a car mid-July while riding their bikes. Following repair surgery, and according to a close family member, the boys have mastered movement in the wheelchairs like pros and their recovery is progressing extremely well. Rotaract Blue expressed a heartfelt thank you to its partner sponsor: Cayman Medical Supplies who kindly donated the wheelchairs. The club also thanked their mother club, Rotary Central for their assistance and support during this initiative. As a result of the donations, Rotaract Blue will create a rental programme whereby used wheelchairs will be provided at a minimum rental fee - especially to those families who are unable to afford brand new wheelchairs due to lack of health insurance or financial strain. The proceeds from the rental programme will be used to purchase additional chairs. President Yvette said this is surely one way to have a direct, immediate impact not only on injured persons but also their families. Given that this will be an on-going initiative, Rotaract Blue reminds the public to cherish the value of mobility and assist those who want the chance to do so in any way possible. The club encourages public support for its new venture. For additional information on Rotaract Blue’s Wheelchair Rental Programme or to become a sponsor, please contact rotaractblue@gmail.com.